I must have been 12 or 13 at the time, but even then I noticed the quirks of the Adam. Booting directly to a word processor seemed odd to me. The power supply and switch for the whole computer built into the printer?? What if I wanted a new/better printer, or what if my printer died??? Why did my Buck Rogers cassettes keep dying? But the games were pretty cool. Buck Rogers was great. Dragons Lair was amazing even if the gameplay with so simplistic. Fortune Builder (a ColecoVision cartridge) was an awesome strategy / SimCity type game. I eventually figured out that my cassettes would die if I inserted them into the drive before powering the computer up. I remember finding a discrepancy in the documentation – I believe the documentation for my Adam said to insert the cassette then power the computer on. However, the documentation for at least some of the cassettes said to turn the computer on, THEN insert the cassette, and then hit the reset button on the computer to reboot into the game. Once I started doing things in the correct order I had no further cassette failures. 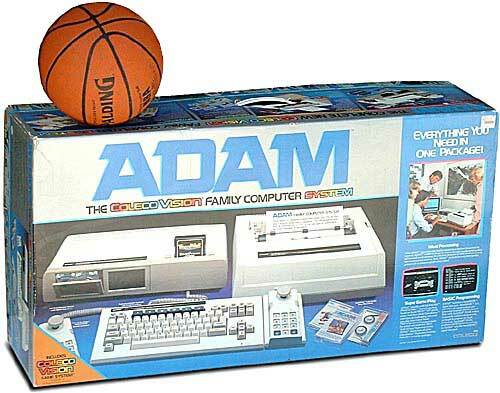 My cousin had an Adam as well, and I remember talking to his dad about the problem – but he’s a pretty stubborn guy and if I remember correctly he kept killing his cassettes for some time because he insisted on following the Adam instruction manual. It was amusing to search the internet recently and discover that this was a common problem with the Adam. Software for the Adam was hard to find (other than ColecoVision cartridges), and I remember seeing all this cool software for other computers at the time and not much for the Adam. I remember wondering if I could purchase a game on cassette from my local Radio Shack (for the Tandy I believe) and play it on my Adam – “It’s a cassette, right?? What could be the difference?”. I must have purchased the Adam right before it was discontinued, which explains why it was on sale for so cheap.